C. Reinhardt (ed. 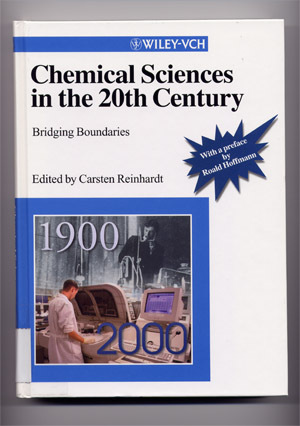 ), Chemical Sciences in the 20th Century - Component of : Early Ideas in the History of Quantum Chemistry. Between Physics and Chemistry in the 1920s and 1930s. 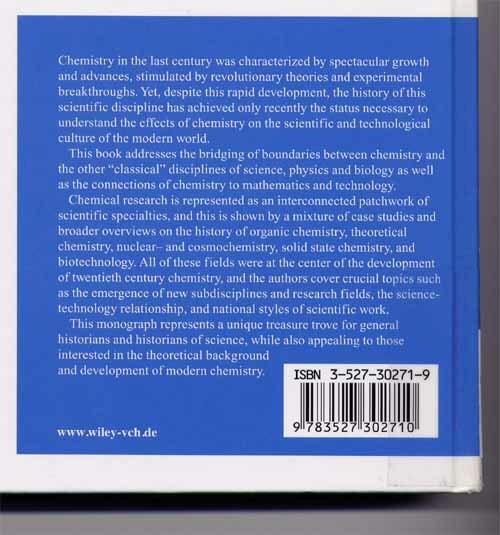 Why do active chemists need the history of chemistry? And why some of us are resistant to Clio's art in the laboratory? These are the questions I want to think about. First, because everything has a history. Things happened, in a chronology and influenced by a personal past (a chemist's advisors, his or her students), in communication with others, and in the setting of a society. The system of science uses the addiction to curiosity of moderately smart, fallible, and underpaid individuals in the labor of a micro-society whose aim is to generate reliable knowledge of the beautiful world within and around us. This gloriously successful European invention demands open publication and communication and mandates frequent dipping back and forth between theory and reality. The tying of such a structure to normal human aspirations (suppressing some along the way, with consequences easily anticipated) nearly guarantees that any interesting new finding will be tested by someone out to prove it wrong. Science, being process, has a history - of individuals, their tools, their communications. It is natural that we should want to know how Diels and Alder got to the reaction named after them. That we discover how discovery took place. The second reason I see for doing history of chemistry is simply that it is interesting to see how ideas evolved. Even if one was in the middle of the fray. Or, maybe, just because one was there: My mother and I were busy surviving World War II in Galicia; the news we had of the war was fragmentary and propagandistic. What a joy it was to read years later Winston Churchill's history of the Second World War! Chemistry isn't war, but there is a lot of action in those 500 000 articles published each year. One interesting aspect of doing the history of 20th century chemistry is that the events are likely to be close to the personal experience of chemist-readers. Or they may see their Doktorvaters in them. Since we are human, and prone to selfjustificafion, that proximity in time is likely to lead the responder to focus on the critical - the fact missed, the factor misjudged. Third, the human in us is absolutely insatiable in its interest for the personal. When the medium is inherently expressive, as in a novel, we just take it in (though we may wonder who that character is based on). But if the mode of expression in which we ply our trade excludes (as the scientific article regretfully does) writing of people, motivation, emotion, anger, then we simply love it when it is allowed to come back. In Nachtisch gossip, for instance. Or, to be serious about it, many of us will recall the tremendous impact of the threadbare two line biographies of organic chemists in "Fieser and Fieser". Students are starving for history, and good teachers know this. Fourth, history humanizes. The social construction of science program antagonizes scientists, almost reflexively. I think the SCS approach deserves what it gets, in part because it sometimes clothes an antipathy to the organism in the cloak of trying to bring us to see the practice of science as being no different from any other human enterprise. Good history of chemistry (and analysis of real life chemical practice) is not aggressive. It comes out of love for the subject, and shows by example how science is embedded in culture, that scientists are people with faibles and mind sets (call them themata, call them prejudices) that influence what they create. Good history of chemistry relaxes scientists, makes them more tolerant (by a hair) of what the humanities have to say about science. This last point leads me to think about why chemists are suspicious of history of chemistry (until such time as they try to do some history). 2. Science has bought into the cult of the new, with a vengeance. References to old papers are in there only to stake out claims to novelty ("no one since 1912 has .. .") or to establish lines of authority. The Oedipal urge is heightened in the enterprise ("the only prior calculations on this molecule are by the unsatisfactory extended Hückel method"). Nothing new here, except perhaps the pace. Given this valorization of the new, it is especially difficult to enter the mind set of chemistry done two hundred years ago. Many chemists don't have the patience to partake of the world past. They don't see the value. Incidentally, one of the oft-cited uses of history is that we may learn from the past. The behavior of individuals and nations leads one to be skeptical of the idea. Sometimes we learn, sometimes (as in falling in love) it's good that we don't. It's the same for chemists - it may be good not to know that someone else had tried an experiment and it failed. 3. There is a skepticism among chemists that historians can acquire the cognitive structure of chemists and so "understand" them. This is sometimes a silly conceit, because many of the historians of chemistry have the "passport" of a Ph. D. or have practiced chemistry. Shall we listen to the chemists themselves? Autobiographies are often poor history (to be exceeded in their unreliability only by biographies - pathography or hagiography - by children of their parents). But I think historians should ask practitioners in the field not only for fact checking, but also for expressions of that intangible feeling that an analysis is off. We are occasionally inebriated by the beauty of what we have created in science. It is as if in that moment of understanding we were speaking to the gods. And when one touches the sublime, moral considerations don't mafter. Werner Heisenberg, in his wartime visits to the Netherlands and Denmark wanted to talk science; he had no idea what it meant to be a human being (one who by chance is a scientist) in an occupied country. History helps here, as I was reminded in a conversation with Hunter R. Rawlings, Cornell's President and a classical scholar, expert on the Greek historian Thucydides. Rawlings (and Thucydides) would stress the moral utility of history. History tells us how human beings acted, and asks us to think about the motives and consequences of their actions. In reconstructing history, we move outside of ourselves, and - not abdicating the capacity to feel strongly about what transpired - we are pushed gently toward alternative perspectives, towards tolerance, towards empathy. This has real spiritual value.